A PHYSICS PhD student at the University of Limerick has won a prestigious national award that recognises excellence in graduate research communication. 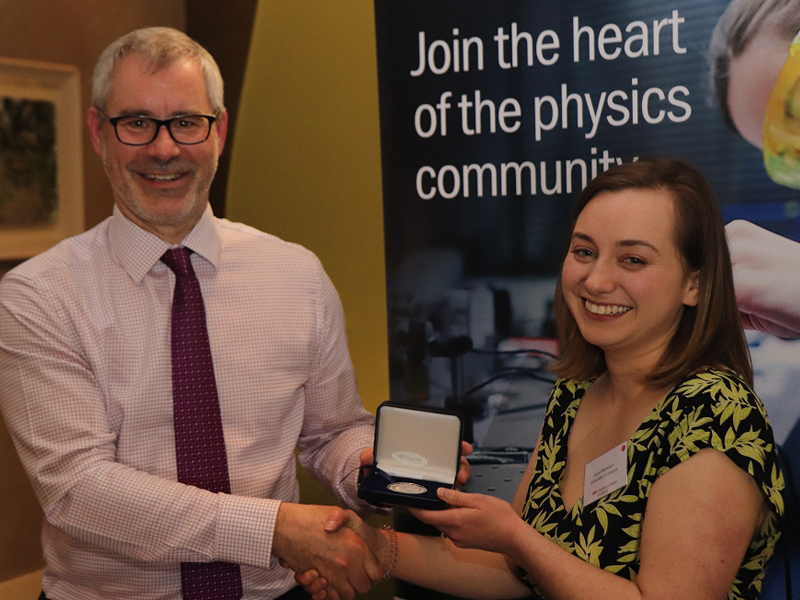 Sarah Markham, a PhD student of the Department of Physics and Bernal Institute at UL, was awarded the 2019 Institute of Physics in Ireland (IOPI) Rosse Medal at a recent ceremony. A native of Meelick, Co. Clare, Sarah was among 25 physics postgraduate students from higher education institutions across Ireland competing for the medal, which was awarded at the Institute of Physics in Ireland’s annual Spring Meeting, held on March 30th at the Sheraton Hotel in Athlone. The medal, which commemorates contributions to science of the 3rd Earl of Rosse, Sir William Parsons, is awarded annually for graduate research communication, with particular emphasis on how the research is communicated to a broad audience via a poster and oral presentation. The competition entailed fiercely fought rounds comprising posters and oral presentations. Sarah’s research emanated from an industry targeted project on developing image contrast of devices during endoscopic ultrasonic imaging and is funded through the Science Foundation Ireland (SFI) Centre for Medical Devices, CURAM. Dr Christophe Silien and Professor Tofail Syed from the Department of Physics and Bernal Institute, University of Limerick jointly supervise her PhD thesis. Almost seventy people attended the IOPI event, which took Climate of Change as its theme. It combined academic talks on topics including the physics of climate change, climate science in the media and how to achieve a consensus for action on climate change. There were also lively interactive sessions on the importance of making environmental science accessible through Irish Sign Language. 2015 Aimee Stapleton, for her presentation titled ‘Piezoelectricity in Proteins’ .